Hi everyone... It's time for our Monthly DT dare at Your Next Stamp and this month we were Dared to use Stripes!! 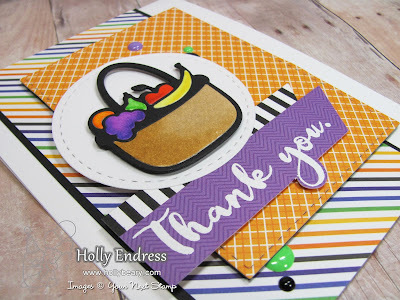 I'm using the new Fruit Basket Stacked die for a fun Bright Thank You card. I created a White Top Folding card base and then I added some layers of Pattern paper from Doodlebug. I die cut the center panel using the Stitched Rectangle dies. Then I created two banners one with the Stripe-Tastic Stamp set for some Black and White Stripes and then I stamped the sentiment onto a piece of the pattern paper and heat embossed in it White. I die cut the Fruit basket from some Black Card stock and White card stock. I paper Pieced it together after coloring the Fruit with some Zig Real Color Brush Markers. I adhered the backset to a die cut circle using some Foam tape. I created the Circle using the Circle Die & Circles Stitching marks set. For an extra pop of color I added some of the Spellbound Gumdrops. Head over to the YNS Blog for more projects from the DT and leave a comment while you are there for a chance to win a Stamp set of your choice!